A visual representation of a printed page on a computer screen is not an electronic journal. Transferring information to electronic journals is not as simple or as inexpensive as readers might believe. It is not clear how to build a successful financial model that will sustain high-quality scientific literature — hardly the ideal climate for introducing major, untried products and services. And yet, we have no choice. These would be challenging times even without the electronic revolution. The volume of research results produced today is beginning to outpace our ability to cope with it. Library budgets are constrained. There is more material to be published, but fewer subscribers to help pay the bills. For the traditional journals, journal producers must maintain the print-on-paper system while we adopt new technologies. Thus we are incurring significant new costs while markets are shrinking. Authors and readers frequently have new and unrealistic expectations. Many individuals have come to think that information they receive online should be free. The claim that electronic publishing will dramatically reduce costs is wrong. Electronic journals exploit the medium to enhance the content of the articles they publish. They include videos, 3-D images, virtual reality models, executable math, computer models, and access to large data sets that can be downloaded. They publish material that cannot be printed. Experimentation is risky and expensive, but necessary. The new technologies for electronic publishing are simply too powerful to ignore. They can and will revolutionize scientific publishing, but we must take care that this revolution leads to a better, more useful information system and not to chaos. With proper attention, the emerging information system can become a significant and dynamic tool in the research process, not just a passive support or background service. The American Geophysical Union (AGU), along with the American Meteorological Society and the Association of American Geographers, started its first electronic journal, Earth Interactions, in 1997. 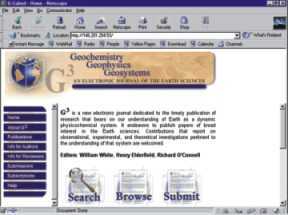 Geochemistry, Geophysics, Geosystems (at right), jointly published by AGU and the Geochemical Society, came online in December of 1999. One thing I’ve learned as AGU’s director of publications is that the scientific community has a schizophrenic attitude toward these true electronic journals. Readers are enthusiastic about accessing new kinds of material, but not all authors are interested in or ready to provide articles that fully exploit an electronic journal’s potential. A surprising number of the contributions to AGU’s electronic journals have not taken advantage of the possibilities. One would think that these new publishing formats would be particularly attractive to young researchers who have grown up with computers. A young researcher normally cannot afford to publish in a journal that is not well established regardless of the journal’s format. The tenure race strongly influences where junior faculty will publish. For AGU’s first electronic journal, senior faculty members steered young scientists away partly because the journal was new but partly because it had no printed version. The second electronic-only journal has fared better. Senior scientists have begun to co-author papers with their younger colleagues. Is the community saying, “I’d like to have access to a novel electronic journal but don’t ask me or my students to submit our work to it”? Many of the advantages an electronic journal offers can be compromised by irrational attachments to attributes of a printed product. For example, electronic publishing slows if articles are held for some artificial issue or a preset publication time. “Issues” are necessary for printed journals to bind loose articles. They are not relevant for an electronic journal, which can post each article as it is ready and thereby speed the total publication process. The greatest challenge for producers of electronic journals will be taking care of those journals. To serve tomorrow’s researchers, we must keep the files in good condition, refreshing them as needed. We must also be prepared to move material to new platforms and new forms of storage as old systems become obsolete. We cannot rely on libraries to archive these interactive journals. The electronic journal is not a static document that can be maintained by a multitude of different care givers using different systems. At the simplest level, new links are constantly being added to articles through forward and backward referencing (forward referencing, a new concept only possible with electronic documents, links and article to the future articles that cite it). But the big challenge is transporting the content forward as technology changes. AGU is taking great care in determining the formats for archiving. For example, we are translating all text to SGML (Standardized General Markup Language), because this format has the greatest potential for conversion and reuse. We have settled on two formats for static figures (one for raster and one for vector) and on one format for moving images. All author-supplied material must be translated into the archive formats. We expect to maintain detailed information about the standards of these formats and to migrate to new standards periodically in order to keep the archive current and useful. This process will be costly and we have created a trust fund to endow the archive’s maintenance. A major debate within AGU committees is whether we must work now to assure that the electronic material will function in the future. Must an interactive computer model published in 2000 still be functional in 2020 or 2080? We have decided not. We must create sufficient documentation now for future journal readers to see how data were manipulated. Perhaps the truly interested reader might rebuild the program. But the electronic journal cannot guarantee that the computer code will still work in the future any more than print journals that documented computer code 20 years ago could guarantee that code’s utility today. These problems do not plague just a handful of electronic journals. Printed journals are starting to offer their readers electronic supplementary material. When this supplementary material is not part of the formal literature, we need not worry about archiving it. But when it is part of the literature, we must remember that the print version and the electronic version are different. Which is the version of record? I believe we will see the electronic version dominate and the print become a byproduct. However, so long as we must sustain both print and electronic versions, we are adding costs through duplication. Someone must pay these added costs, preferably someone interested in the long-term health of the scientific record. One model for financing the distribution and archiving of electronic journals is the government-created, government-supported model, such as PubMed Central from the National Institutes of Health. It offers “free online access to the full text of life science research articles,” according to the site. Its creators expect to deliver, without cost to the reader, peer-reviewed journals published by others. The advantages seem obvious. The government has the money necessary to create the delivery system and probably has excess computer infrastructure and technology capacity. But no money flows back to the journals in this model — namely, money for producing the articles in the first place. Furthermore, a government-owned information system is at political risk. Congress can pull the plug simply by failing to fund the delivery system. Worse yet, Congress could in effect censor parts of the information system for political reasons. The 1998 release of the Pew Charitable Trusts study, “To Publish and Perish,” which examined the problems of the increase in both the volume and price of information, touched off discussion about a university-based archiving system. The premise is that a university can and should own and distribute the intellectual output of its faculty. Certainly, Academe has a vested interest in the creation of and access to knowledge. For this reason, universities are more trustworthy guardians than the government. On the downside, it is difficult to tell if scientific literature will be as useful or as rich if it is organized on an institutional basis. If a university’s interests shift, it may not sustain its original services. Research done outside of universities might not fare as well. Funding for a university-based system would have to come from tuition or from grant overheads. Or, if the cost must come from subscriptions and thus from the users, what would we gain? With free information for all? These distribution schemes attempt to give free access to information. All three address the price — or non-price — of distribution. They do not address the costs of production and distribution. Nothing I have encountered convinces me that the costs of electronic publication will be less than the costs of printing for most scientific journals. Publications with huge subscription bases, such as Science, Nature and The New England Journal of Medicine, might realize savings if they distribute only in electronic form, because a high percentage of their costs come from paper and postage. But this trend is not true for the majority of scientific journals. As a rule of thumb, about 80 percent of the cost of printing a scientific journal come from the “first copy costs”: the review process, copyediting, or preparing material for printing and binding. Unless we abandon editorial selection and copyediting, most of these first copy costs persist for the electronic journal. Some will be more expensive on a per-page basis. As a journal incorporates more electronic features, its staff must have a higher level of computer expertise and therefore its personnel costs will increase. Then the journal must add the expense of hardware and software, and of computer systems people to support the editorial and production staff. I am not convinced that the costs of electronic distribution for typical scientific journals will be less than the costs of paper distribution, when all accounting is carefully done. Because AGU has decided to deliver journals from its own Web site, it is investing in hardware, upgrading operating software, adding computer experts, buying off-the-shelf programs, and developing programs specific to its needs when necessary. These development costs are new and real. If AGU chose a commercial vendor, it would incur similar costs but have less control on the results. “Experimentation” will be a necessary cost of electronic publishing for a long time to come. Electronic publications offer benefits and challenges alike. I’ve delivered a litany of technical, financial and even sociological headaches. But the pain is worthwhile because the true electronic journal puts a powerful new tool in the hands of research scientists. At the same time, it is critical for scientists to be involved in defining the electronic journal systems that will best serve the various disciplines. Only then will the electronic journal reach its potential. “To publish and perish,” Policy Perspectives, vol. 7, no. 4, March 1998.